The warming weather says patio season — time to dress up the patio with containers full of flowers. To make a stunning container you can enjoy from now until frost, follow these simple tips and tricks. Use traditional flower pots of varying sizes or get creative with any type of container that can hold soil, water and has drainage holes. Rather than digging dirt from the yard, use good potting soil as it has the drainage that container plants need. Place soil in the container within 3-4 inches of the top if using small plants in four- or six-packs. Fill the container a bit lower if using larger, more mature plants. Will patio pots be mostly in shade or sun? If your patio is shaded, then you need shade loving plants such as impatiens or begonias. If it’s sunny, then you need plants that take full sun such as petunias, zinnias, marigolds, etc. Next, think about color and shape. Do you want bright, multicolored arrangements or softer pastels? Do you prefer shades of mostly one color with some foliage or a multicolor scheme? There are so many flower choices, it’s wise to have a concept in mind before you shop. Thriller: A tall plant in the middle of the container. It can be a spike of foliage or other tall plants. Filler: Mounding plants such as petunias or geraniums. They will fill in most of the container around the base of the thriller. Spiller: Plants that spill over the edge of the container and can be foliage such as ivy or sweet potato vine or cascading flowers. For a 12-inch wide container, you will need about seven to nine plants, for a 14-inch pot you will need nine to 11 plants; and for larger containers at 18-24-inches, you will need about 16-20 plants. How much space should I leave between plants so there’s room to grow? The closer you place plants in the container, the faster it will look full. Yet, by mid summer when plants have really matured, the container could be so full that it becomes difficult to water. When using small plants that have been grown in four- and six-packs, it’s good to plant two or even four of these smaller plants together rather than separating each one. Space each group of plants about 4 to 6 inches apart depending on the varieties. Aggressive plants like sweet potato vine will need the full 6-inch spacing so there is room to spread. 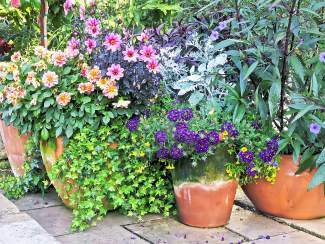 If you use plants in 3.5-inch or larger pots, it is not necessary to group them together. Instead, space single plants a few inches apart. Use a time release fertilizer that does not need to be applied often. This keeps the plants blooming and growing without having to remember to fertilize every week with a liquid feed. Mulch with Soil Pep or ground bark or cocoa bean hulls to help hold in moisture. Recycle the original plastic plant pots and plant tags at a local garden center. Need help creating and maintaining patio and porch containers? Find a Pro among ALCC’s members in six chapters statewide. Becky Garber is member of the Associated Landscape Contractors of Colorado of which Neils Lunceford, a landscaping company, is a member. You may contact them at 970-468-0340.